Fujifilm has introduced a new compact system camera, the X-Pro 1 which has a newly designed X-Trans 16 million pixel APS-C CMOS sensor. The new sensor, Fuji claims, is capable of delivering resolution of the same quality, if not superior, to a full-frame sensor. It all comes down to a new colour filter array that has been inspired by the technology used in traditional film (analogue) cameras. The array means that the optical low-pass filter is not reuired, this usually reduces moiré and false colour generated by sensors, but also degrades the resolution. On the new X-Trans sensor, RGB pixels have been arranged randomly, eliminating the cause of moiré problems, while the presence of an R, G and B pixel in every horizontal and vertical pixel series also minimises the generation of false colours. Also newly developed for the X-Pro 1 is a powerful processor, the EXR Processor Pro. Fujifilm claims that this enables the camera to deliver high speed and high precision image processing. First seen in the X100, the X-Pro 1 is the latest Fuji camera to feature a Hybrid Viewfinder, which has the ability to instantly switch between an Optical Viewfinder (OVF) and Electronic Viewfinder (EVF), combining the best of both worlds. For instance, minimal shutter lag and bright viewing image can be had with the OVF, while focus compensation, exposure information, depth of field indicators and so on can be seen via the EVF. The body of the X-Pro 1 is made from die-case aliminium alloy, and it has been engineered with the same retro aesthetic of the X100 and X10 cameras in mind. Dials, such as those for shutter speed and exposure compensation, are made from solid metal. Featuring a synthetic leather finish, the camera is resistant to the elements, while the manufacturing process has been designed to reproduce the look and feel of authentic leather. Building further on Fuji's long legacy of film production, several film simulation modes are available on the X-Pro 1. These include the ability to create Multiple Exposures and the new Professional Colour Negative Film Modes (Pro Neg. Std and Pro Neg. Hi). Film Simulation bracketing is also available, meaning the same scene can be shot in a variety of the film modes. These modes reproduce classic Fujifilm emulsions, such as Velvia, ASTIA and PROVIA. Monochrome film photography can also be recreated and there's a sepia filter mode for more nostalgic effects. The X-mount lens design has been engineered to make the most of the mirrorless body design, meaning the rear lens elements are as close as possible to the sensor. The wide opening allows the lens to be mounted deeper within the body, reducing the back focus distance of each lens to the minimum possible. Along with the X-Pro 1, a series of fast aperture prime lenses will be available at launch to fit the new mount. These are the XF18mm f/2, the XF 35mm f/1.4 and the XF60MM f/2.4 macro lens. All feature moulded aperture diaphragm blades, which are curved to create a circular aperture at all settings. The barrel of each lens is made from high-quality metal, with an aperture ring in 1/3 step increments. Although there is no in-built flash on the camera, a shoe-mountable flash (EF-X20) can be purchased separately. Featuring two dials, the flash has also been designed to match the styling of the camera. Other accessories including a leather case and hand-grip will also be available to purchase. 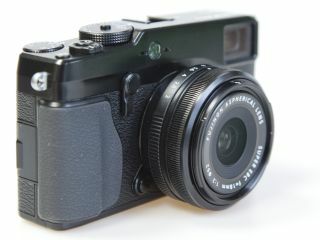 The Fujifilm X-Pro 1 UK price has not yet been confirmed, nor has availability. Keep following for more updates on this information as it becomes available.